The Museum of Old Domestic Life is one of the hidden treasures of High Point. It’s filled with everyday items from Quaker families who lived in Guilford and Randolph Counties in the 1800s. You’ll find hundreds of things from everyday rural life – clothing, tools, furniture, cooking, books, saddles, and more! 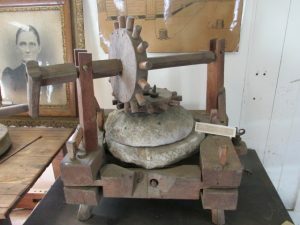 You may recognize some items – most people know a butter churn or a carpenter’s plane. You might notice the full-size loom in one corner, or a set of candle molds. But do you know what a hackle is? What do you do with a riddle, or a quern? There are yokes, bellows, mills, kraut choppers, and many more items to puzzle over. One of the things which makes the museum special is that it’s a “hands on” place – you can touch and handle most of the items on display. 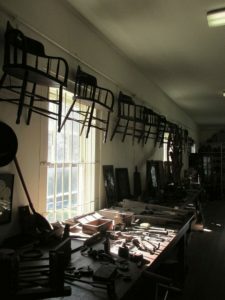 You can study dozens of chairs made by the early furniture industry in High Point. You can also look at dozens of portraits and photos, account books and letters. 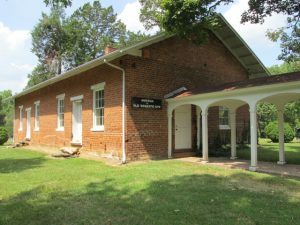 The museum is housed in a Quaker meetinghouse built in 1858 from bricks hand-made and baked on the site. Back in the 1800’s, families arrived on horseback, and you can still see the old stone “upping blocks” where they dismounted at the door. Outside is the Springfield Friends Cemetery, one of the oldest in the area – the first recorded burial was in 1780! The cemetery is a rich resource for people doing genealogy and tracing their family roots. The Museum of Old Domestic Life is open by appointment only. Please call before you come! To see it, please contact the curator, Brenda Haworth, 1-336-882-3054 or e-mail her at bgh@northstate.net.